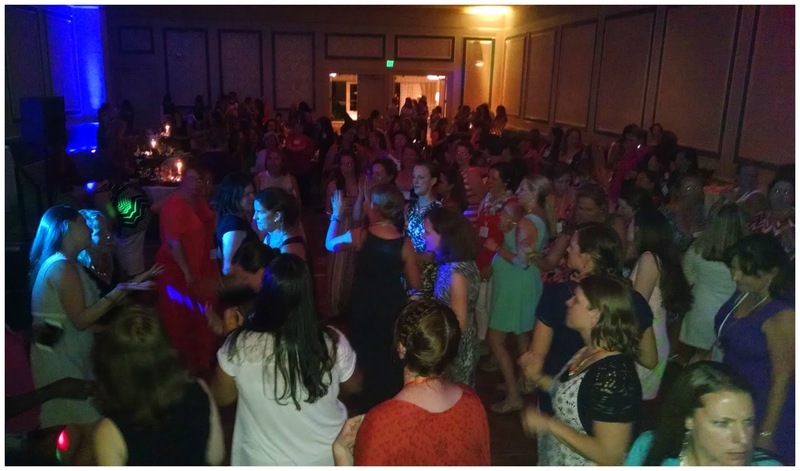 A Slice of Smith Life: The Edel Gathering Weekend 2015: Full of Lots of Surprises! 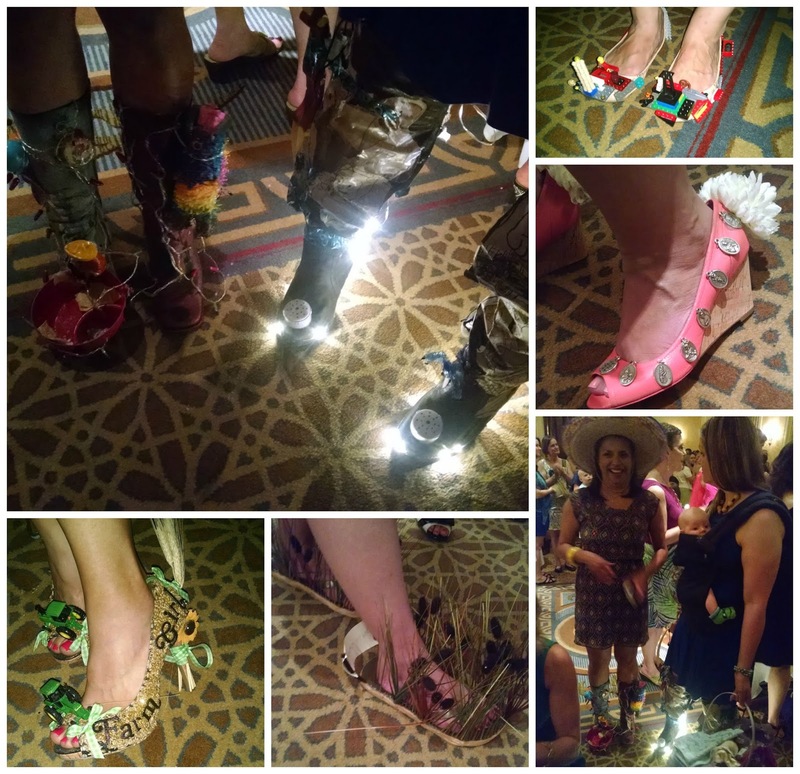 The Edel Gathering Weekend 2015: Full of Lots of Surprises! I'm not sure how to recap such a memorable weekend into one blog post, but I'll do my best. There was so much fun, festivities, and surprises that went on, I'm still winding down from the big weekend and trying to process it all! The Edel Gathering 2015 took place in beautiful downtown Charleston, SC, July 10-11, 2015. 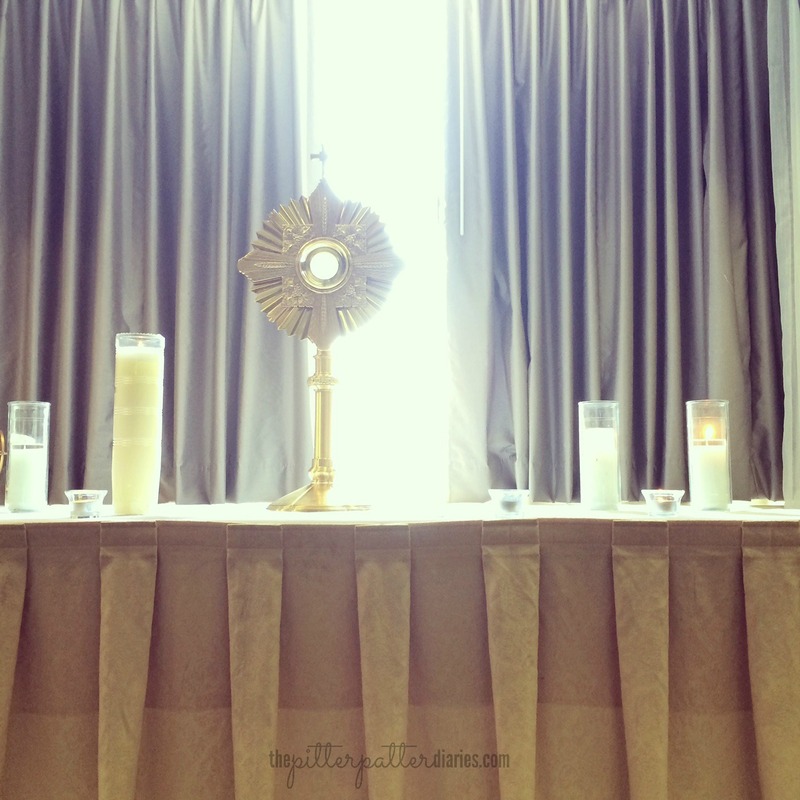 I'd been looking forward to this Catholic women's getaway for about 8 months and it was well worth the wait! I'm grateful I was able to attend. The tagline for the Edel Gathering is Refresh.Connect.Enjoy. I definitely did all 3! As Kelly mentioned in her talk, even if you didn't get to Edel this year for a much needed break, no worries, there's a ton of other great ways to hang out and Refresh.Connect.Enjoy. 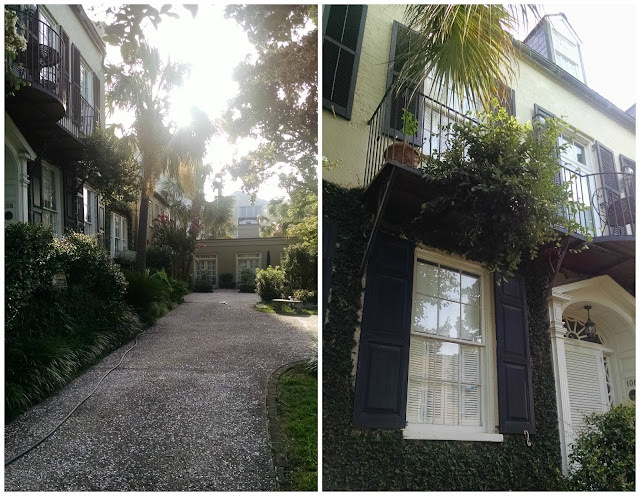 Heather and I arrived in Charleston Friday afternoon. 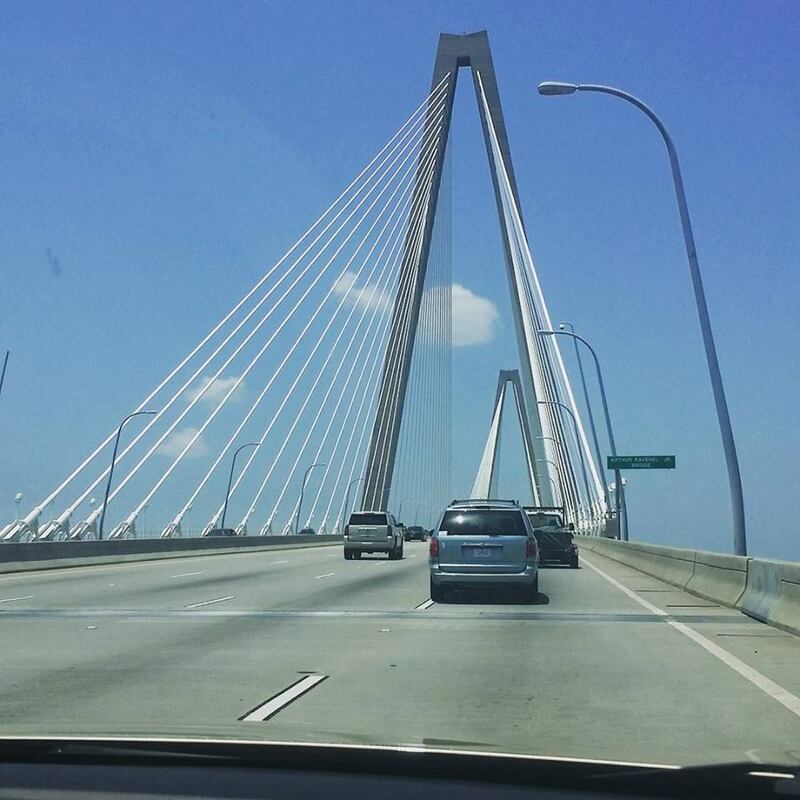 Isn't this bridge beautiful? 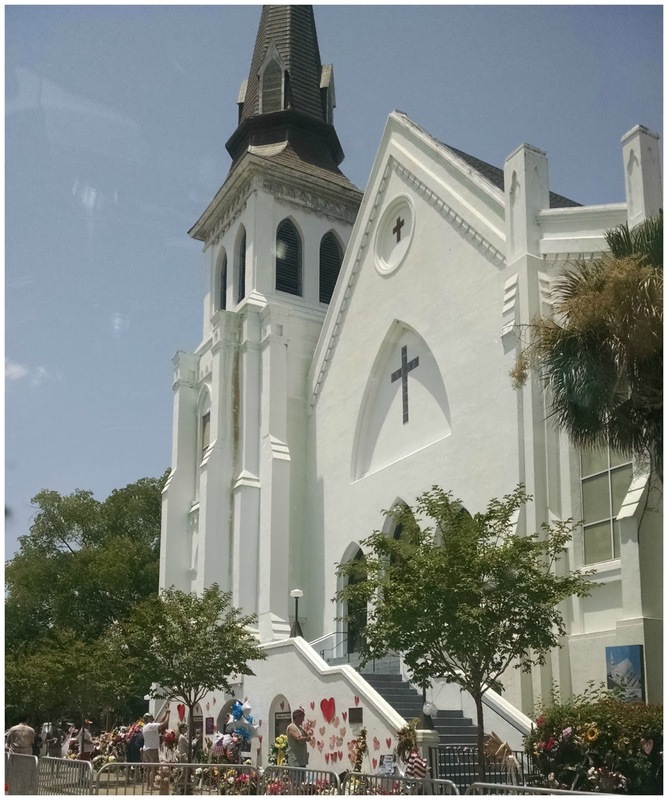 Just down from the beautiful and elegant Francis Marion hotel where we stayed was the Bethel AME Church where precious lives were lost not too long ago. Some of the ladies at Edel were able to walk to this church on Saturday to pray for the souls of the deceased and for all those suffering from the tragedy. Unfortunately, I was unable to attend the prayer service, but I snapped a picture of the site as we were stopped in traffic on the way to the hotel. After we checked in to the hotel we grabbed a bite to eat and walked downtown. Around the corner from the hotel was a delicious cookie shop with this great chair inside. This tall orange chair was screaming photo opp...so we obliged. 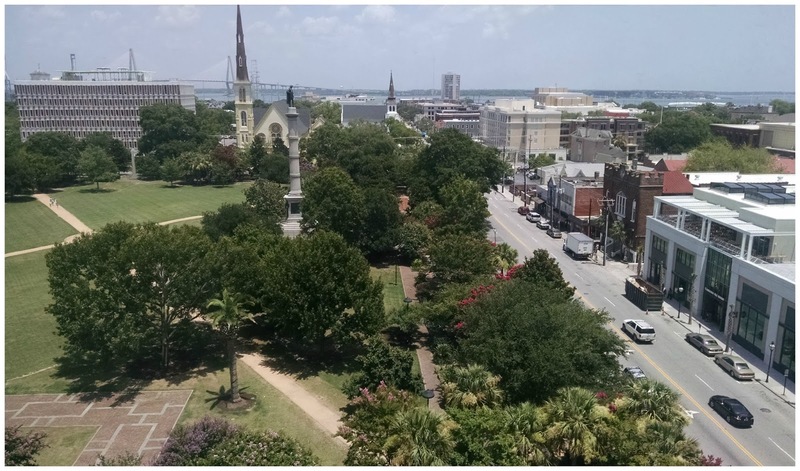 View from my hotel room at the Francis Marion. Friday afternoon I was part of the live audience of Jennifer Fulwiler's Radio Show on The Catholic Channel. Lino Rulli graciously let Jennifer Fulwiler and Hallie Lord take his 2 hour program time slot so they could feature guests during the Edel Gathering. Emily DeArdo was also interviewed about her 10 year anniversary for her double lung transplant as she battles cystic fibrosis. Such an inspiring story and gal! 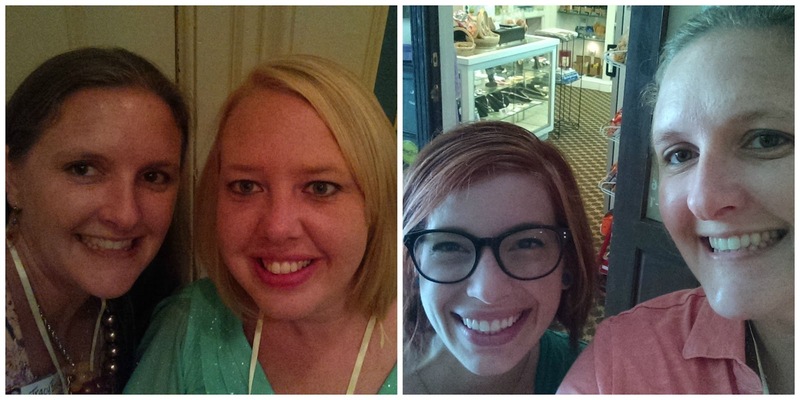 I loved meeting and chatting with her over the weekend. 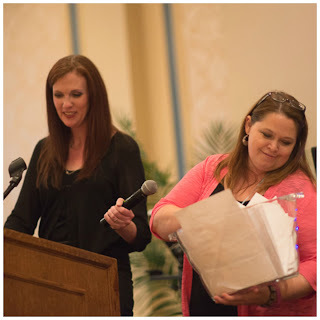 Heather Renshaw was surprised when Jennifer Fulwiler asked her to come up front to be interviewed about the Catholic Women Rejoice! Conference. I really enjoyed hearing how Heather was called to bring Catholic women together in her state of Oregon. Us Catholic women need and crave community! Thanks Heather, Jennifer, and Hallie for bringing uplifting Catholic conferences to so many! There were so many funny parts in the show with talk that Hallie was having contractions and her due date was that day! 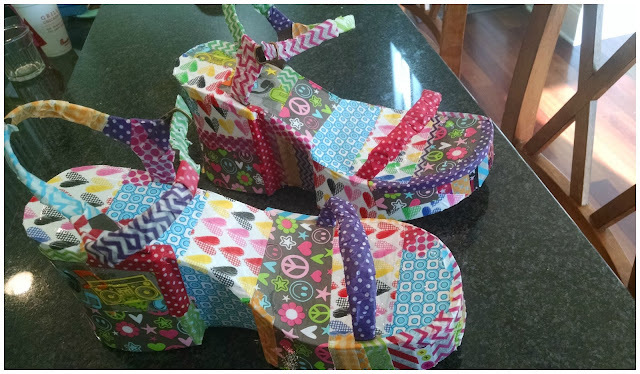 Jennifer and Hallie designed and made their crazy shoes on the show for the contest. Jesus punching a shark sounds like a crazy shoe idea to me! The show ended with the audience singing "Sweet Caroline", a very meaningful song for the Edel weekend. It was a lot of fun to see Jennifer's show live! More crazy shoes that were oh so crazy and creative! After the crazy shoe cocktail party ended, several ladies met up with new and not so new friends in the hotel's bar. Here I am sitting with Tara, Karen, Paige and Ally. 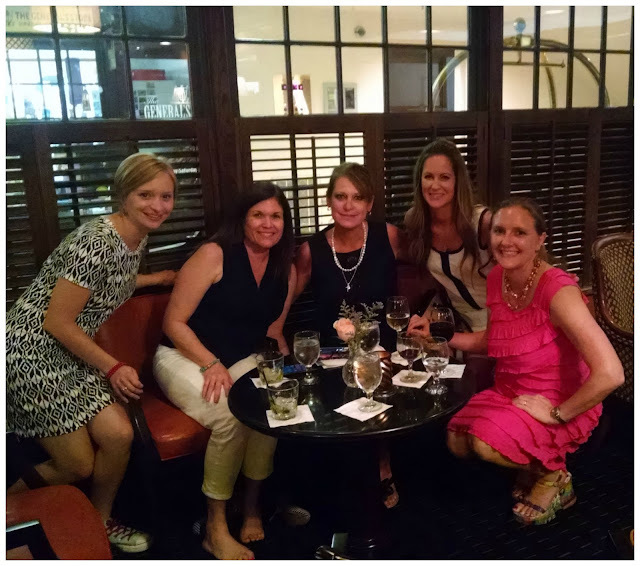 It was great to hang out with these special and fun ladies! Saturday morning I was up bright and early to meet Susanna, Aimee, Katie, and Eva for a run/walk to Battery Park on the downtown sidewalks. 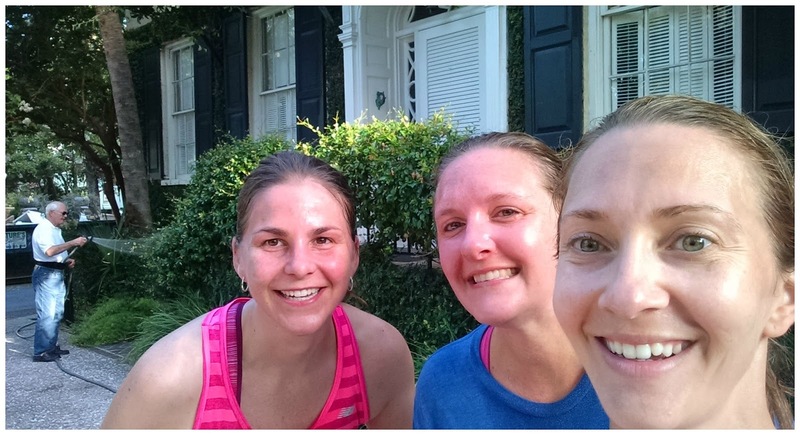 I ran about 3 miles and though it was hot and humid, it was bareable and fun as we chatted and got to know one another. On the way back to the hotel we spotted this quaint and beautiful home and courtyard so we stopped and took some pictures with our sweaty selves and the yard man let us cool off in the hose as we splashed water on ourselves. Soooo I got back to the hotel only to realize and be surprised that taking a shower right after a run on a very hot and humid day was not going to happen (let's just say our hotel was having some pump and water pressure problems). Walking around half the day with only having a rag "bath" was an interesting experience! Having a bad cold over the weekend didn't help the comfort level either, BUT it all turned out fine by the afternoon and getting a shower was heavenly! 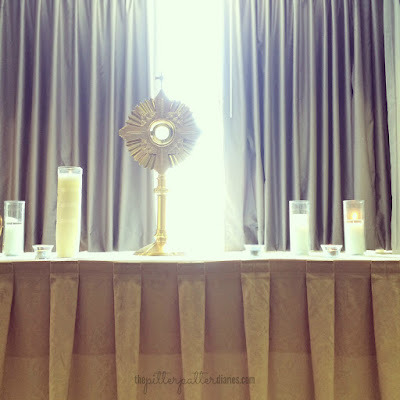 Speaking of heaven, in the afternoon I had the awesome privilege to go to Eucharistic adoration in the hotel and benediction as Eucharistic Adoration ended. It was a blessed time to sit quietly with our Lord. For a list of all the quotes Kelly used in her great talk, they are listed in this post. Her most memorable quote would have to be one she made up herself, “Every time you bless yourself, it’s like punching the devil in the face.” I have several opportunities to punch the devil so I'm busy blessing myself often! Saturday evening several ladies and I went to 5:30 PM vigil Mass at the Cathedral of St. John the Baptist. Beautiful church! 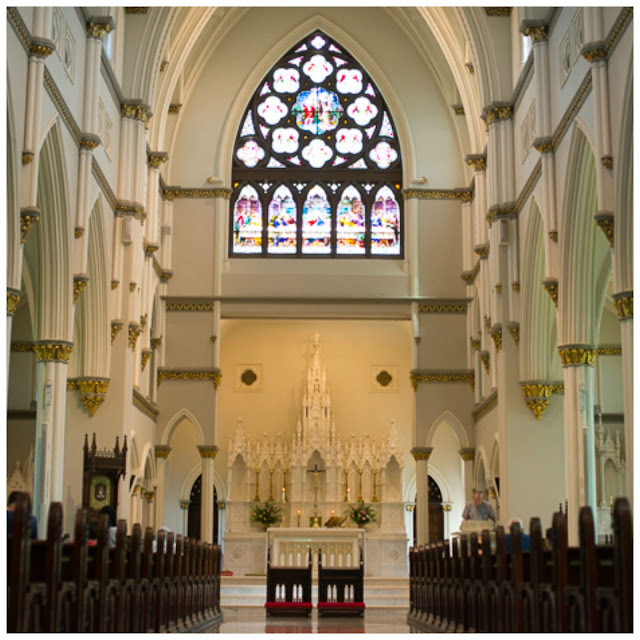 I sat in the back on the left side and up ahead on the side altar I was surprised to see a statue of St. Therese of Lisieux. She continues to tap me on my shoulder and get my attention. I just wish I thought to take a picture of the statue. On Saturday night we enjoyed a delicious buffet dinner and heard a talk by Audrey Assad, a singer, musician and songwriter who spoke to us about some very personal struggles and her struggles of being a first time mom to her son. It was very powerful and inspiring! During the dinner, there was a random drawing from the "get to know you" surveys that we filled out at registration on Saturday afternoon. I was surprised that my name was selected and with a table full of prizes, this book, Mornings with Saint Therese, grabbed my attention so I snatched it up. I've enjoyed reading these short daily readings to get to know this Saint that keeps tapping me on my shoulder in the most surprising ways! At the afternoon registration, each attendee was given a random saint medal and I got St. Catherine of Siena. 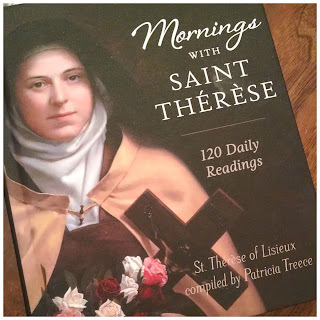 I was thinking that maybe St. Therese would be handed to me, but that wasn't meant to be. I look forward to getting to know St. Catherine better and the group of ladies that also got St. Catherine as we have started a Saint Sisters of St. Catherine group on Facebook. 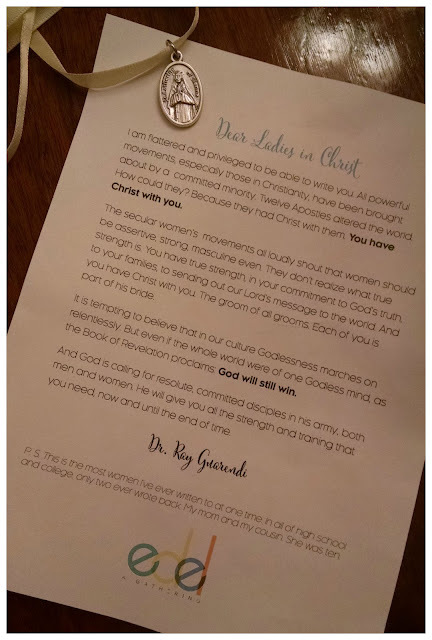 We also received this letter from Dr. Ray that was at our table setting. After dinner and dessert it was time for the dancing and karaoke! So fun to celebrate the gift of womanhood and motherhood this way! I got some quick pictures with Jennifer Fulwiler. I first heard Jennifer speak at Ignited by Truth and snapped this picture with her. She is so down to earth and fun and I'm grateful she and Hallie were inspired to create this second Edel Gathering so close to my home since the first Edel Gathering was in Texas in 2014. 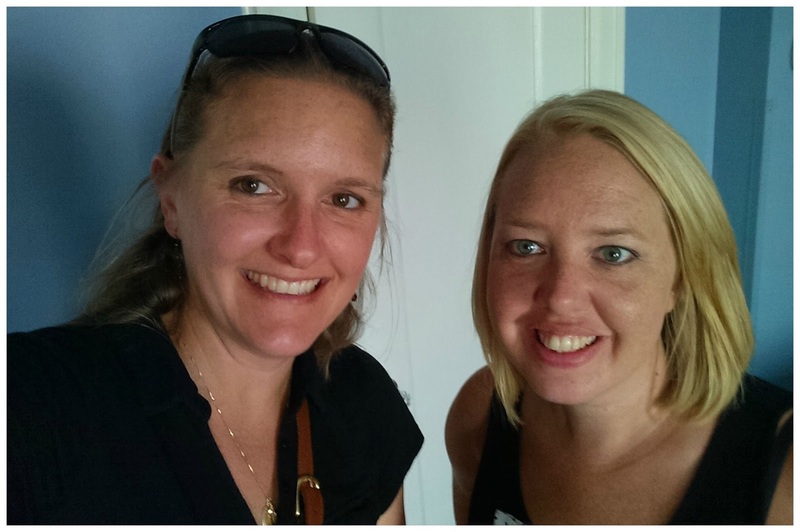 I also loved meeting Mary Lenaburg from Passionate Perseverance. During the dance I took a pictures with Heather Bowen from Life of a Homeschool Mom who drove with me on my way to Charleston. 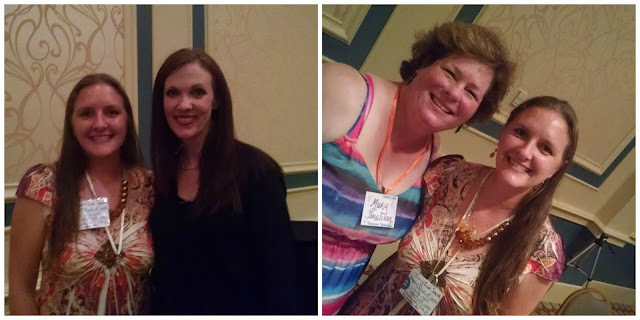 As we were checking out of the hotel on Sunday, I snapped a quick photo with Haley Stewart from Carrots with Michaelmas who did a fabulous job being the emcee for Edel, despite not feeling well and having a hoarse voice. These pictures are really dark since they were taken at the dance, but in the far left shot I'm standing with one of Jennifer Fulwiler's aunts and Jennifer's mom. It was so fun to chat with some of Jennifer's family members as they all worked hard to make Edel 2015 a successful and fun event. On the right side is a photo with a very pregnant, ready to go into labor any second, Hallie Lord, Jennifer Fulwiler's friend and co-host of the Edel Gathering. I got up on stage to sing with Tara, Ally and Eva and "Let It Go". It was a memorable experience for sure and I surprised myself by being brave enough to do it! 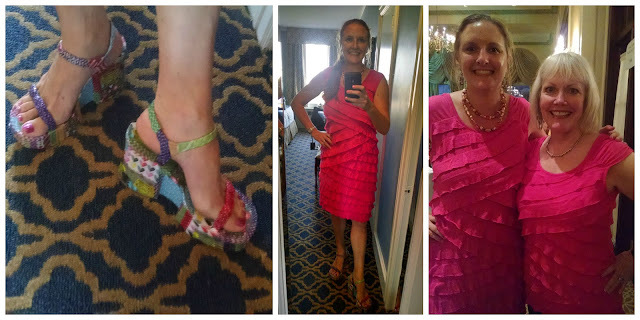 On Sunday, July 12, Heather and I checked out of the hotel and headed home. 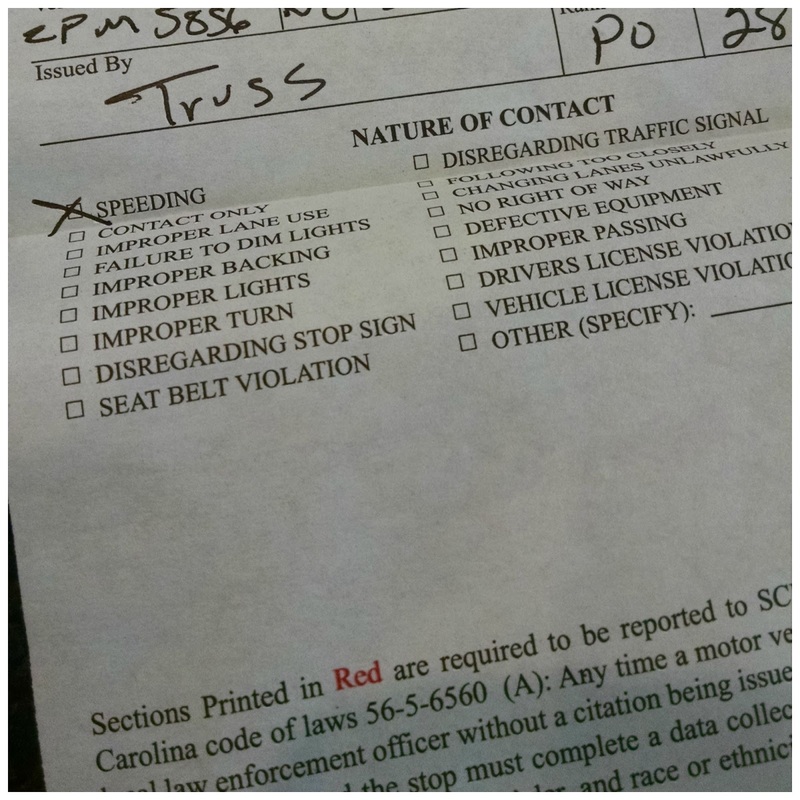 Another (not so good) surprise for the weekend was seeing blue lights flashing behind my car as I headed into Myrtle Beach to drop off Heather. I was going a little too fast. 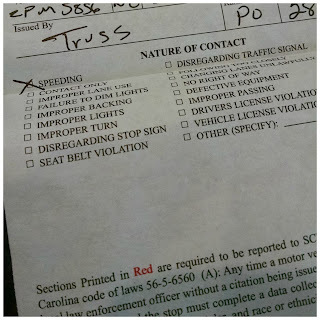 Ok well he clocked me going 59 in a 45. :/ I was about in tears and grabbed my St. Catherine medal and prayed I wouldn't get a ticket! The cop was so nice and he surprised me by giving me just a warning! I was driving oh so carefully from that point on. July 12th was my 18th wedding anniversary and though I had so much fun with friends at Edel, I was looking forward to seeing my husband and children again. 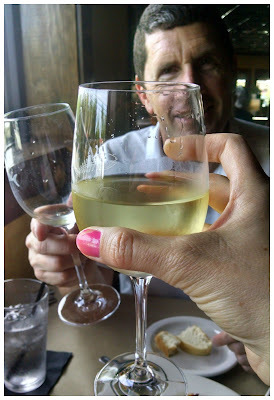 Anthony took me out to dinner Sunday evening and then he blindfolded me which brought back memories of how he blindfolded me to bring me to the spot on the beach where he proposed to me in August 1996. Little did I know that Anthony had been planning a huge surprise for me for awhile! Not only was my house clean when I got home from Edel Sunday afternoon and beautiful flowers were on our bar, but I walked into our house that was filled with dear family and friends for my 40th surprise birthday party! 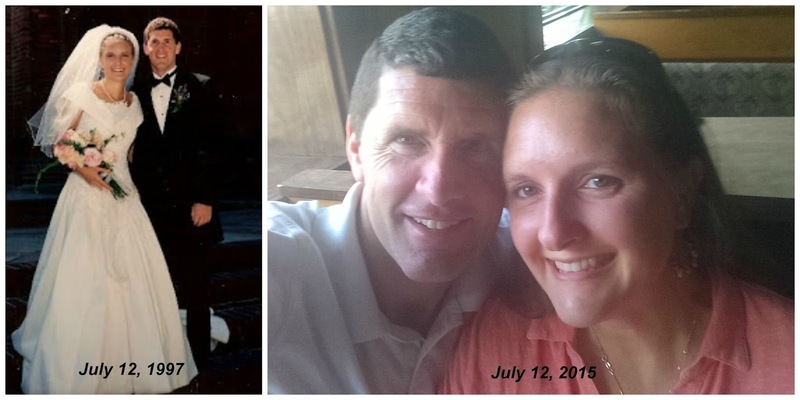 I don't turn 40 until August 24th so I was in shock! I was so touched that Anthony worked so hard to make a wonderful Anni-birth-sary celebration :) I was so surprised that my younger sister and nephew flew in for the celebration! Dear friends of ours even surprised me by singing a special performance of the Sound of Music's "You are 39 going on 40" because they know that the "Sound of Music" is my favorite movie. It was hilarious and an epic performance! My little sister and my nephew coming down from PA made my weekend and surprise party extra special! So there you have it. A weekend full of fun, festivities, and surprises! I only wish I could have met everyone at #edel15 because I know that each amazing woman there has their own amazing life stories. The Edel Gathering was definitely confirmation for me that I am NOT alone in my trials and triumphs in my vocation as a Catholic mom in this crazy and upside down world. May you find surprising and creative ways to Refresh.Connect.Enjoy in whatever location God provides and whatever vocation God has called you! For more posts about other bloggers' #edel15 weekend be sure to visit Kelly's link up! Thanks Kelly for the link up! Glad you had such a fabulous time with all those women! But I am entirely impressed with what Anthony did for you! That rocks! And things only get better after 40! Oh my gosh, what a wonderful post! Thanks for all the fun pics and info all about the Edel weekend!!! I recognize many names/faces and it;s fun to put them together here! It looks like you had a fantastic time!! Happy anniversary! I see your anniv post in my inbox and have not gotten to it yet! Just arried home this Am and so looking fwd to catching up. Happy early birthday my friend!!! So you have a milestone bday this year too, my friend?? HAHA. I "only" have ten years on you girl. Ok, I'll just let myself believe it's "only" a decade! Fantastic pics of the family party.....your hubby is such a sweetheart....what a terrific surprise!! Oh, my goodness, what a GREAT recap! 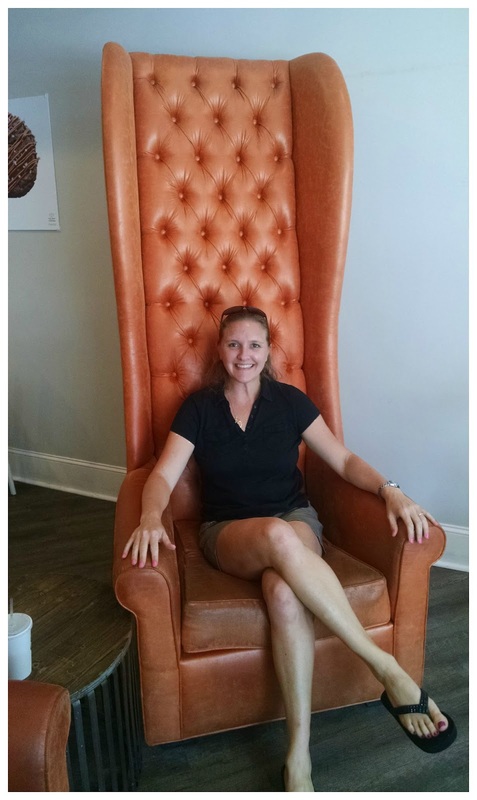 I especially loved the big orange chair and the surprise party. How awesome!! I wish we could have met and spent some time visiting. I'm a runner and homeschooler too....we would have had a lot to chat about! I'm a new follower and am looking forward to keeping up with you right here....hopefully we can meet in 2017! Thank you so much Chris! Celebrating the "milestones" can be so fun, huh? :) Thanks for your sweet comments always! Thank you Susan! I know our paths crossed alot at Edel and I just loved your farm shoes :) Wish we could have chatted too! Next time! And I love your blog! New follower here! :) God bless! Loved re-living the weekend through all of your great photos! It's been such a treat to hear how much the weekend meant to everyone. Happy anniversary and happy birthday! God bless!